We’d been invited to an event where we’d been promised canapes made with pine mushrooms. 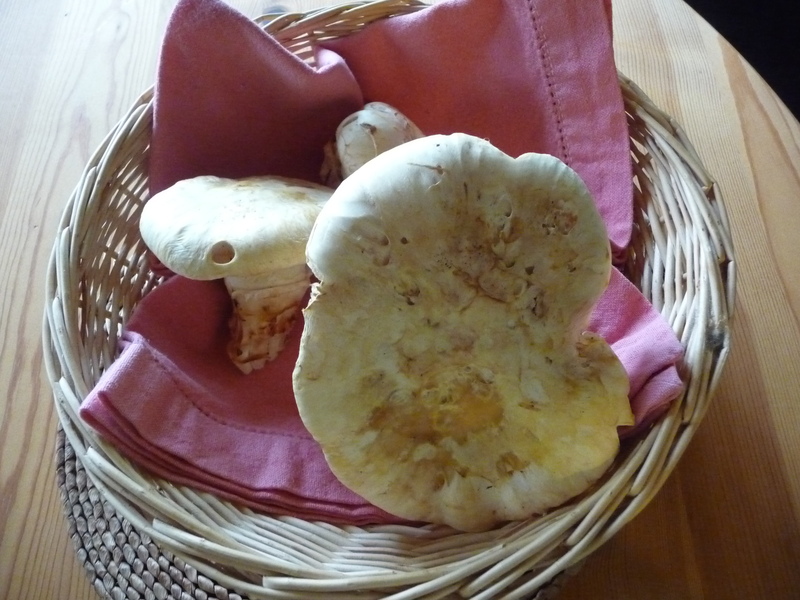 I promised, in return, some flatbreads with last week’s chanterelles and while the dough was rising, we went for a walk. How serendipitous, then, to find four pine mushrooms, in a place we’ve never found them before! At first, seeing the hump of white in the duff, I thought they were white russulas but then saw the veil on two of the small ones (the others were mature) and of course once you’ve smelled pine mushrooms — I always think of soy sauce — you can quite easily recognize that odour again. ~ by theresakishkan on November 5, 2011. This entry was posted on November 5, 2011 at 5:07 pm and is filed under Uncategorized.You can follow any responses to this entry through the RSS 2.0 feed.You can leave a response, or trackback from your own site.